The buildings within the master plan are conceived as shards of glass or rock crystals emerging from the landscape. 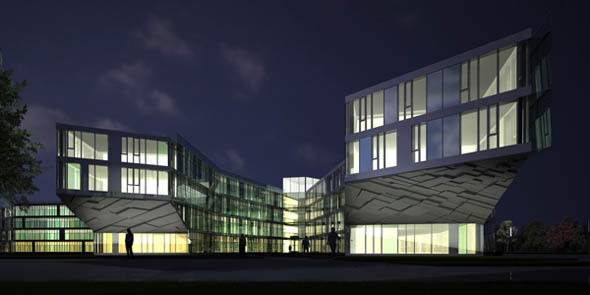 The Council offices are composed of three “˜fingers’ or wings, measuring 13.5m in width and tapering in parts of their plan, allowing the building to be naturally ventilated. All three fingers are four stories in height and sit on a podium, under which is contained two levels of car parking. The offices have exposed concrete ceilings and utilize a “chilled floor slab”. This approach uses embedded pipes in the concrete floors, taking water from the adjacent river Blackwater to create chilled water in Summer and heated water in Winter. This provides space heating and cooling for the internal environment at relatively low cost. The building achieves a BER rating of “˜A3′ as a result of the considered approach taken to the building envelope and careful environmental design. 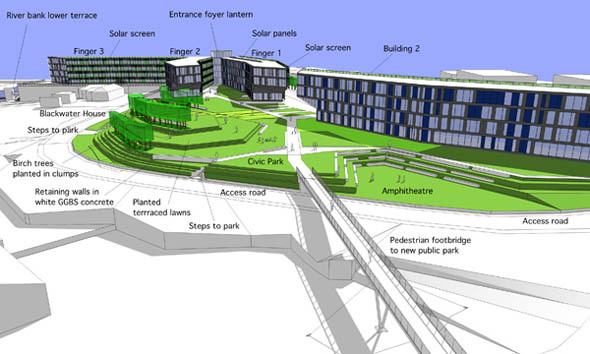 The positioning of the Council building on the site is designed to minimise site coverage and create an ‘edge’ to the site, fronting the road. 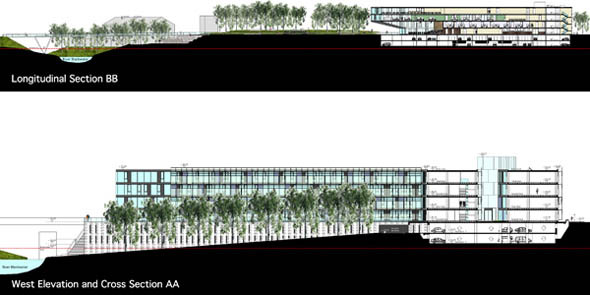 The idea of edge is reinforced by the siting of two slender office blocks on the southern boundary of the site. This “˜edge’ allows the landscape behind to be sheltered from road noise and creates tranquil landscaped spaces for both public and staff members. The civic park connects to the public park to the north by way of a new foot bridge proposed as part of our master plan.